One of the iconic vessels from the Star Wars franchise, the TIE Fighter was bound to be a popular Lego set from the moment the licensing deal was announced. The set has been around since May 2015, to the roughly two-year run is pretty typical. As of the time of this writing, the set is still available on both Amazon and the Lego Shop for MSRP. The Lego Shop has this one flagged as being Hard to Find, indicating that now is a good time to pick this one up. While the set is still available on a limited basis, it is tough to gauge the potential resale market for this one down the line. The set does have a few major points going for it, however. Being Star Wars, the set will remain more desirable than some others a there aren’t many fanbases as rabid as Star Wars fans. Second, being an Ultimate Collector Series means this is the biggest, most detailed TIE Fighter set Lego has released. A big, detailed, collector’s edition of one of the most collected and desired IPs in the world? Seems like a pretty strong bet to see a value increase after retirement. 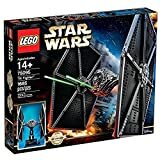 More details on the set from Lego.com: We proudly present the Ultimate Collector Series LEGO® Star Wars™ TIE Fighter™. As featured in many of the action-packed Star Wars™ battle scenes, including the decisive battle that led to the destruction of the first Death Star™, this large-scale LEGO-brick rendition of the classic Imperial starfighter has intricate detailing, as well as an opening top hatch and an exclusive TIE Fighter Pilot™ minifigure with a blaster pistol. And when you want to keep it safe from Rebel attack, mount the model on the display stand and keep yourself updated with all the key facts and figures on the included fact plaque. The Ultimate Collector Series TIE Fighter™ is the perfect addition to your Star Wars™ collection!